​Coal Hill, Inc is committed to enhancing fandom by creating fun and innovative podcasts, music, art, books, and interactive experiences. Melissa teaches at Cal Poly Pomona, and specializes in Renaissance drama and werewolves in Harry Potter. Pinkie Pie is Best Pony. Will is a poet & singer/songwriter based in Columbus, GA. Dawn is a lifelong fangirl. When not opining on her favorite fandoms, she can be found working as a professional writer and editor, planning new burlesque routines under her alter ego Regina Monologue, and helping animals as a rescue and rehabilitation volunteer. Read more of her Supernatural opinions at www.pieandshotguns.com. Dustin has been a fan of comic books and science fiction for over 20 years. He has a Master’s in Negotiation and Conflict Resolution from Columbia University. Scarlett is a freelance writer, amateur seamstress, and cosplayer who considers herself “just a kid from Brooklyn”. She is a proud New Yorker in part because so many of her favorite fictional heroes, from Captain America to Spider Man, all hail from the Big Apple. Julia is, like fan-fiction, an amalgamation of all those things the author wishes she could be and were possible. Stephen is a stay-at-home dad, husband, podcaster, writer, performer, & all around geek. Emma is a Children’s and Youth Librarian in Wellesley, MA, where she recommends geeky books, geekily entertains babies, hosts geeky ukulele jam sessions, and turns picture books into geeky plays. She has previously worked as a drama teacher, storyteller, actress, environmental science teacher, playwright, literary manager for screenwriters, grammar teacher, mask maker, and once did a one day stint as a the receptionist at the Jazzercise Corporate Headquarters. Jennifer works as a graphic designer and fine artist. She loves to create many of the graphics, props and visuals for MISTI-Con, HP-NYC, and her Etsy shop, Jenny’s Oubliette. In true Hufflepuff pride, she runs her own cake decorating business, Jenny’s Cakes With Character, specializing in geek-themed culinary creations. Jennifer recently co-founded a fandom based party planning business, Geek Party Chic. She is happy to make life more beautiful, and edible too! Alex is a student in Northern Virginia and lives with his wonderful girlfriend, Lauren. Amanda-Rae is an avid live tweeter, blogger, and cosplayer of period dramas. When she is not crying over how unfair The Halcyon’s cancellation was, she is the Director of Cosplay Programming and Press Liaison for L.I. Who. Cat is an actor, musician, writer, costume geek and mom, in any order you like. She performs at conventions throughout the country as Miss Nerdstiles. Give her enough ukuleles, and she'll save the world. Clay is the co-head organizer of MISTI-Con a Harry Potter fan convention, co-founder and treasurer of Coal Hill, Inc., and Program & Education Director for the Interfaith Community a non-profit organization focused on helping families from different religious traditions authentically and respectfully navigate their challenges. Christine is a performer, costumer, and cosplayer. She is the founder and costumer of C&C Costume factory which is dedicated to creating the highest quality costume experiences for everyone. Hannah is a stand-up comic, storyteller, and writer from Philadelphia, PA. She also hosts the most incompetent "let's play" gaming series on YouTube, Haneurysm. Andy is a radio and TV producer in Boston. He is also the Vice President of Coal Hill Inc. and writes and performs the “Epic Rap Battles of Who-Story”. Occasionally he sleeps. Betsy is a lawyer in the Atlanta, GA area. In addition to baseball, she loves a good space opera and an occasional game of Dungeons & Dragons. 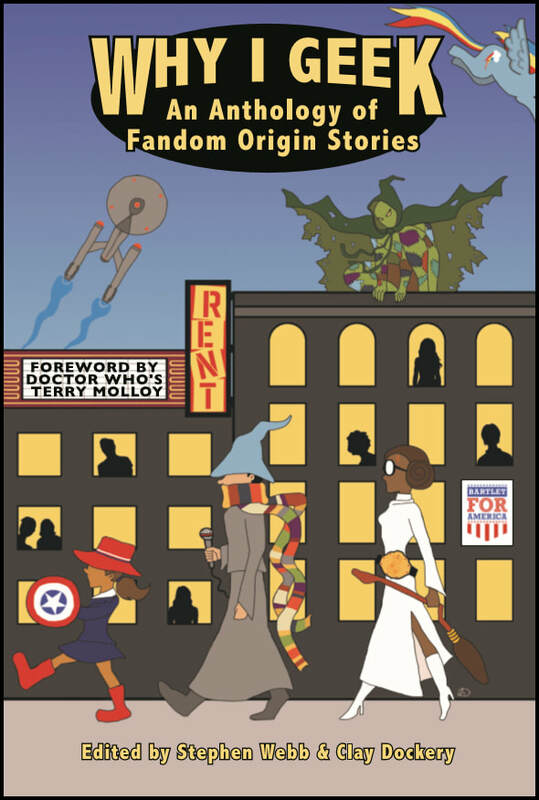 Robert is the author of Who is the Doctor, Who's 50 and The Doctor's Are In (ECW Press), guides to the wonderful world of Doctor Who. He's also the editor extraordinaire of the Outside In series of pop culture reviews with a twist (ATB Publishing), covering Doctor Who, Star Trek and Buffy. In his day job, he's a professor of mathematics and a world leading expert on zombies. Really. A special thanks to Terry Molloy for writing the foreword for "Why I Geek." Terry has been supportive and helpful in all Coal Hill endeavors and we appreciate that so very much. To Monty...er, TERRY! ​Terry Molloy took over the role of Dalek creator Davros in Doctor Who’s “Resurrection of the Daleks,” reprising the role in two subsequent stories, as well as appearing as a policeman in “Attack of of the Cybermen”. In recent years, Terry has reprised the role of Davros in the Big Finish Productions audio dramas Davros, The Juggernauts, Terror Firma, Masters of War, The Davros Mission and the four-part miniseries I, Davros, as well as in a 2005 stage production, The Trial of Davros. Terry also took over the role of Stan Harvey in the ITV soap opera Crossroads, has appeared on BBC 7 opposite the late Nicholas Courtney in The Scarifyers audio series, and more recently in BBC Radio 4’s The Archers.